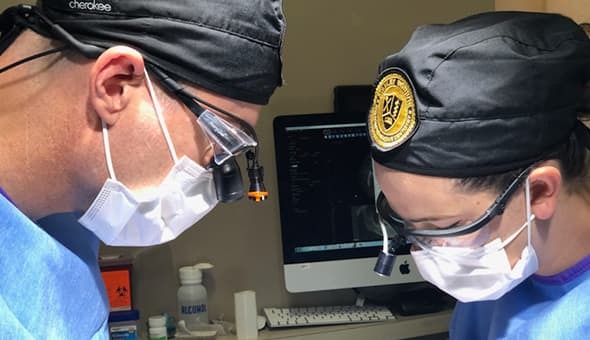 The 2019 Continuum fulfills continuing dental education (CE) standards, and empowers dental professionals and their teams to become implant and restorative experts. Sessions are conveniently held in the Triangle area and are taught by accomplished implantology professionals. Rise above the competition with innovative, easy-to-understand techniques that provide a higher standard of care for your patients. The first session dives into different fixed and removable prosthetic options. Doctors will be taught how to identify and plan single unit implant cases in their office immediately upon course completion. Everyone wants predictable implant results with a maximum aesthetic appeal. The third session takes the information from the previous sessions to incorporate guided hands-on experience. Students will be able to place implants in live patients that they have planned from start to finish. In the final session of the course continuum, participants will have the opportunity to place final restorations. After this session, you have completed the continuum and you will be able to take the knowledge immediately back to your practice.